Toastmasters Speeches: A Fact-Finding Report-Sample Speech, "Drowning Prevention"
A Fact-Finding Report-Sample Speech, "Drowning Prevention"
How does a drowning child in the pool or in the beach look like? For that matter, how can you tell if someone is drowning? Does he raise his arms like this, and waves them furiously? Does he shout, “help!” or “saklolo!!!”? Television and movies may portray incidents of drowning like these. (pause) But friends, that is NOT how it happens. Picture this. Little Johnny is 10 years old playing with his cousins in the water at the beach. The waves caused by their playing pushes Johnny’s rubber ball further away to sea. He chases and reaches for it, but then realizes it’s gone far that the water is now over him. Panic sets in. He tries to shout but all the “shouting” underwater just puts more air out and more water in. He tenses up and rapidly sinks. In a few more seconds he disappears from his cousins’ view and aspirates water. In a few minutes, the cousins finish playing. Then they realize Johnny is not with them. They alert Johnny's “tatay” who’s busy drinking Red Horse with the "barkada". They call on “nanay” who’s busy doing ihaw-ihaw with the tilapia. (pause) But by then it was all too late. Little Johnny has drowned. Now, THAT is a typical drowning incident. It happens quickly and silently. The Philippine Pediatric Society suggests basic aquatic skills to prevent drowning. According to its study, drowning is the leading cause of child injury death in the Philippines. In 1995, out of every four fatal child injuries, one child died of drowning. In 1998, drowning ranked number 7 as cause of death for children 1 – 4 years old. Drowning ranked number 4 for children 5 to 9 years old and ranked number 2 for children aged 10 to 14. Overall, this mode of childhood death had a higher rate compared to motor vehicle accidents. The Philippines’ unique geography and frequent occurrence of typhoons and floods put Filipino children at risk. With more than 7,000 islands, the country has a coastline much longer than the continental United States. Inter-island travel is necessary especially during school vacations. The Philippines holds the world record for deaths at sea. It also has the the world record for the worst single tragedy at sea with the sinking of the MV Dona Paz in 1987 with 4,500 deaths, much bigger than the Titanic disaster. Now there are many ways to help prevent drowning. Wearing of life vests and flotation devices is an important measure. But are we always sufficiently equipped? 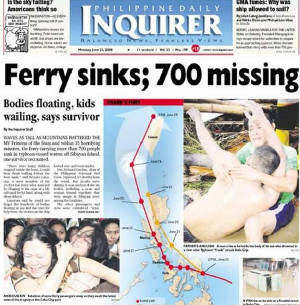 Sea travel in the Philippines has become hazardous with perennial overloading of passengers and cargo. In the swimming pool and resort setting, do we always have lifeguards around? 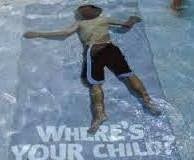 Mostly, I see disclaimer signs saying pool management will not be responsible for children's safety. So what CAN you do as a parent? Keep an eye on kids who are non-swimmers, always. Swimming skills are a safeguard against drowning. Encourage kids to enroll in swimming lessons. It also helps if you have basic skills in resuscitation in the event of a drowning. Learn to swim yourself! I presently swim in a nearby pool 3 times a week and I see college students in PE class at the pool. And I’m appalled by what I see. Out of roughly 90 students that I see in the whole week, I could count with the fingers of one hand, how many could actually traverse the basic 25 meter length of the pool. Now, these aren't small kids. These are college-aged students. So, enroll your kids to swim. If you can’t swim, learn to swim yourself! It might just save little Johnny’s life, as well as yours.